We offer a variety of professional cleaning services in Cardiff and the surrounding areas - we believe in being honest and friendly, and as such we'll always discuss the job in detail with your before any work commences, this way you'll have a good idea of what will be happening and what the results are likely to be. We have our own incredibly powerful cleaning machine which is powered by it's own diesel engine, this machine is mobile allowing us to bring it to our clients homes to deliver them the best possible service. We also bring our own softened water for use with our machine, meaning we won't need to use your electricity and water supplies. We have also had our own bespoke cleaning solution developed especially for us, it's mineral based and leaves non of the smell or stickiness often associated with other cleaning products. Unfortunately we do occasionally need to use very small amounts of chemical solvents to help remove certain stains, for example to remove boot polish stains, or to remove trodden in 'blu-tac' from carpet. In these situation we'll always use as little as possible, and will discuss this with you in detail before moving forward. We offer friendly in-home professional carpet cleaning services in Cardiff and the surrounding areas. Our specialist machine allows us to clean carpets 3-4 times faster than a competitor with a typical 'portable' machine. The way our machine works also helps to speed up the drying process, carpets cleaned by us are typically dry in 2-3 hours. Upholstered furniture such as sofas, dining chairs and poffes should be cleaned regularly, not just when you suddenly have a spill or stain. This will help prolong the furnitures life. A specalised cleaning head helps us to deliver unrivaled results that will leave your furniture looking refreshed. Honestly we don't think it's possible to match the results of professional dry-cleaners for cleaning curtains. But that said we do offer a simple in home curtain cleaning service, this is typically a third of the price of dry cleaning your curtains, and our machine will remove simple stains and leave your curtains looking anew. 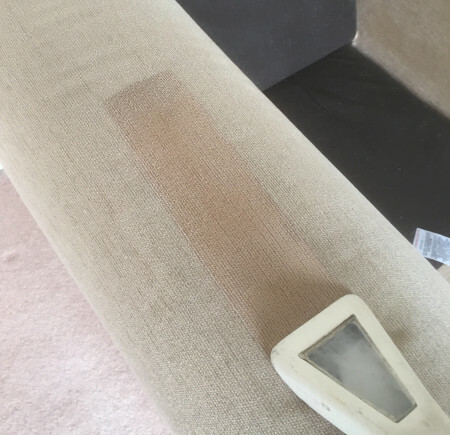 Specialist modern techniques are used to clean leather upholstered furniture, these leave it looking like new. No machinery is used, nor any harsh chemicals or solvents which might damage the leather. We've seen some fantastic results from this process, and always leaves clients delighted with the results. Rugs tend to have long, deep piles, this results in dirt and dust etc collecting at the bottom of the pile. Because of this, when cleaning rugs it's particularly important to ensure a powerful machine is used, this is the only way to lift the dirt and grime out of the piles. Clients are always blown away by the results, and often say the rugs tend to 'shine' after being cleaned by us. Much time and money has been invested into making Cleaning Living Cardiff as environmentally friendly as possible - this is something we strive for. It's because of this that we've had our own bespoke cleaning solution created, many cleaning solutions these days use chemical solvents to achieve their results, but this just wasn't going to work for us. Our mineral-based solution is bio-degradable and made from natural products. Our cleaning solution is very powerful and the results are second to none! Because it's mineral based it also doesn't leave any sticky residue or chemical smells which is a concern for many of our clients. Another problem with chemical based solutions is that they can damage the fabric, leading to the carpet or material ending up with a black tinge.